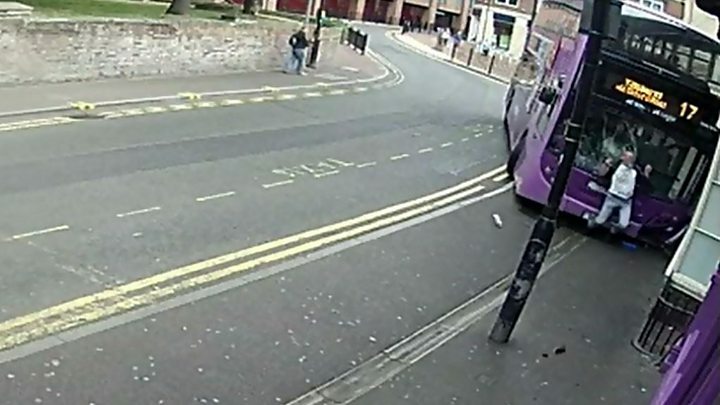 A bus driver has admitted dangerous driving after his double-decker bus hit a pedestrian on a pavement in Reading. Cheikh Daouda Senghor, 40, from St Johns Road in Wallingford, Oxfordshire, pleaded guilty at Reading Magistrates' Court earlier. CCTV footage from 24 June, showing Simon Smith being knocked down in Gun Street before getting up and walking into a bar, went viral. Mr Senghor will be sentenced at Reading Crown Court at a future date.